Home » Kingston Rides In Style! Kingston Rossdale braves the elements while out for a ride in London yesterday. Wrapped up in two hoodies, a thick coat and Wellington boots, Kingston peddled to the shops on his Leonardo DX smart-trike. 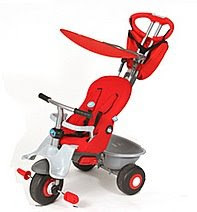 This cool trike features a 5-point harness for younger riders that changes to a seatbelt when they get older. The telescopic parent handle allows the parent to control the direction of travel. The Rossdale boys always get the coolest stuff!